Bed Bug Bite Images - What Do Bed Bug Bites Look Like? Are you one of the many people waking up to itchy bites on your face, neck, or other body parts? If so, it’s probably crossed your mind that they could be from bed bugs. How do you know, though, if they hide during the day and can’t be seen? One way is to find out what bed bug bites look like. Unfortunately, the short answer to what bed bug bites look like is that they’re very similar to many other insect bites. The good news is there are distinguishing features. In this article, you’ll find out the clues to whether your bites are from bed bugs, as well as the usual symptoms of bed bug bites. You’ll also learn what other bugs your bites could potentially be coming from, just in case it’s something else. After all, knowing what pests you have is the only way to properly get rid of them. Let’s start with a look into bed bug habits. When Do Bed Bugs Usually Feed? Where On The Body Do Bed Bugs Bite? How Many Times Does A Bed Bug Bite In A Single Feed? What Are The Main Signs & Symptoms Of A Bed Bug Bite? What Other Bug Bites Can Be Similar To Bed Bugs? Many people assume that bed bugs only feed at night. That’s a misconception. 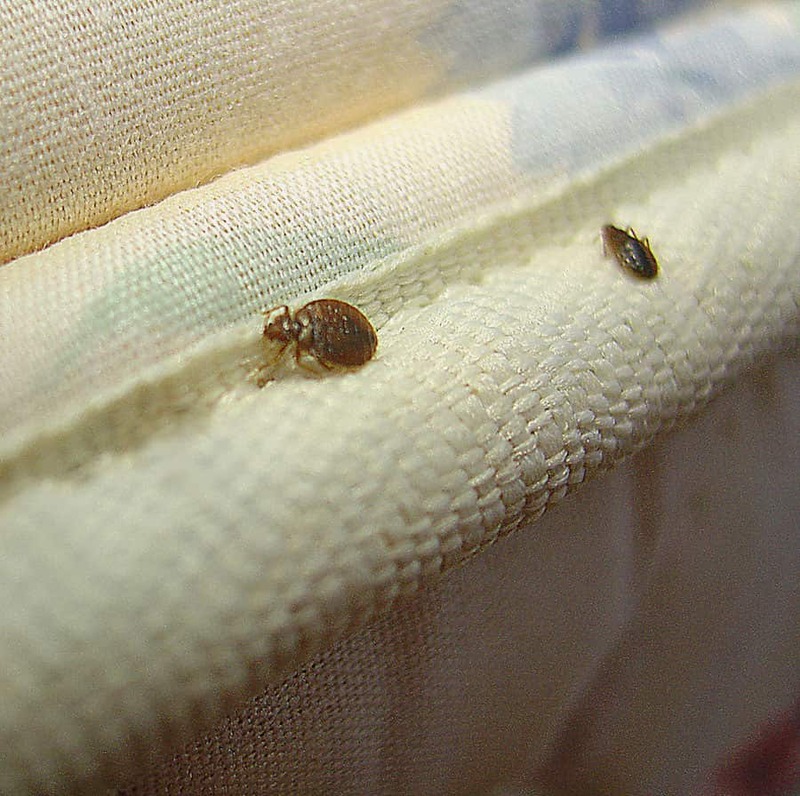 Bed bugs are not truly nocturnal, though it is the most common time for them to bite. The truth is that a bed bug will come out for a meal at whatever time they are most likely to get one in a particular location. What makes a meal convenient for them is that the host is staying still and not noticing them, like when you’re asleep. They can and will, however, take a meal anywhere else that you may be sedentary. That includes in a vehicle, at school, at work, in a movie theater, and many other locations. 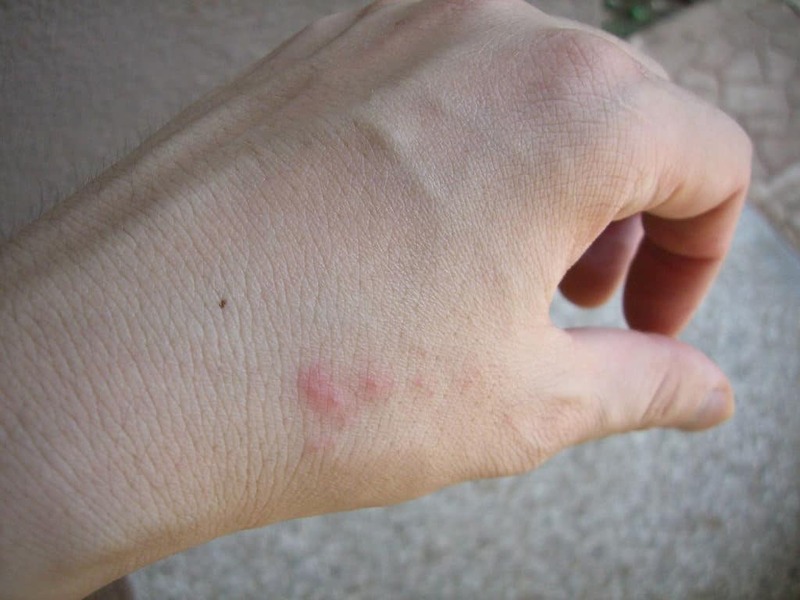 Sometimes the location of bug bites can clue you in to what type of insect they are from. Bed bugs can bite anywhere. They do seem to bite the face, neck, and limbs most often, though. This is simply because those areas are exposed the most while sleeping, and are easy to reach for the bugs. Bed bugs are not picky about which body part they feed from however, so whatever is exposed is fair game. Unlike some other insects, bed bugs cannot jump or fly. That limits their mobility, and of course they want to get their meal as easily as possible and then get out without being noticed. What that means for you is that loose clothing and bedding with weaves that are easy to climb are most likely to give bed bugs access to your blood. Aside from access through loose clothing or lack of clothing, bed bugs also tend to prefer areas with less hair, which is again why the face or neck may be a target. Bed bug mobility is limited to crawling, and although they can crawl fairly fast for insects, obstacles like hair do slow them down. There’s really no single answer to the question of how many times a bed bug bites each time it feeds. Bed bugs tend to take several “meals” per session. Some pest experts call this the “breakfast, lunch, and dinner” pattern. Basically, it means that the bug will feed from one spot, and then move on to a new spot and bite again to get more blood. It really depends on how much blood they’re able to get from a particular feeding location. They will bite until they are full. In some cases, this may take only one bite. In others, it may take several. Keep in mind that multiple bites are also the result of multiple bugs feeding. Typically, all the bites you experience are not from a single bug. Wouldn’t you notice getting jabbed with insect mouth parts this many times during the night? Most likely you would not. Bed bugs have a thin, tiny, and extremely sharp mouth part that pretty much eliminates the feeling of it piercing your skin. Additionally, their saliva contains a mild anesthetic that further reduces any sensation you may feel during the feeding. This is not a sign that bed bugs are considerate feeders. It’s just a safety evolution for them. Feeding without pain to the host means the bed bug can take a meal unnoticed. Because bed bugs feed in a pattern of several bites, they often leave a trail of bite marks. The trail is linear, that is, forming a line across the skin. This is actually one of the best ways to tell if what you have are bed bug bites. 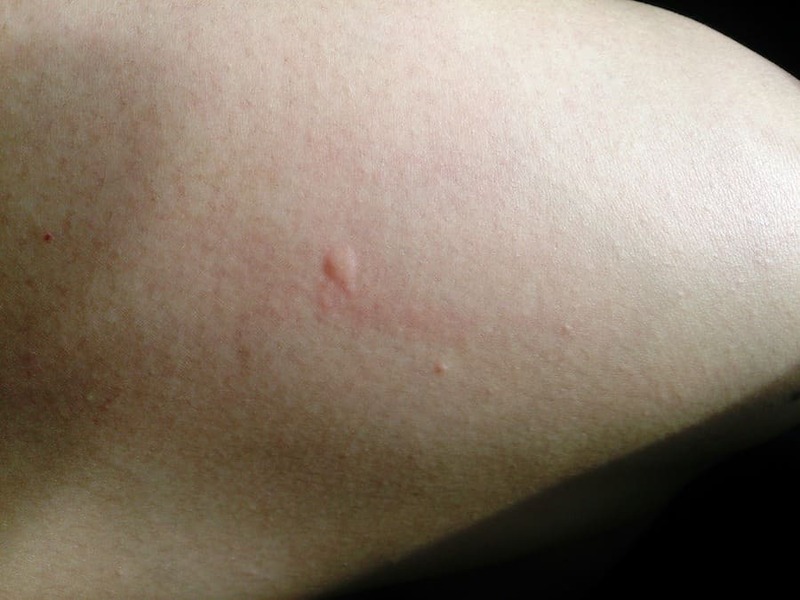 Insects that can jump or fly, like fleas and mosquitoes, do not leave a linear bite pattern. Their patterns are more random. Luckily, unlike mosquitoes, bed bugs aren't known to spread disease, and it's very unlikely they will make a sick. 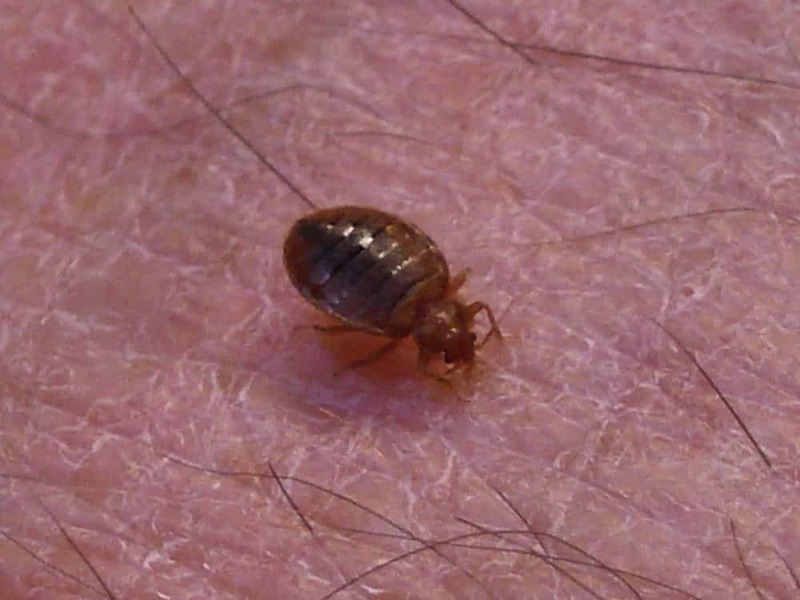 Bed bugs, however, must crawl to the next bite location if they have yet to finished feeding, and following a line to the next available patch of skin is the easiest method for them. The reason why bed bugs bite multiple locations in a single feed is thought to be due to bed bugs being disturbed by a person if they move move about in their sleep, causing a bug to retreat slightly until the person as stopped moving, when they will start feeding again in a slightly different place. Aside from the pattern, the bites are going to look very much like other insect bites. They are red and roughly circular, and they may form blisters or swell slightly. Many people may not see any marks at all, especially the first time they are bitten, or if you do see marks, they may not itch right away. In fact, bite marks can show up and produce symptoms even a couple weeks after initially being bitten. Most people tend to grow more sensitive to bed bug bites over time, as they are continually exposed to the saliva. This means that the longer you have an infestation, the more prominent and annoying the bites become. They will itch much more. They may form blisters. Also, it’s possible to have an allergic reaction from bed bug bites. Allergies to bed bug saliva develop over time, so you may have no reaction the first couple times and then suddenly develop symptoms like hives after another feeding session from these pests. If you do happen to react strongly to the bites, there are some steps you can take to ease your symptoms. For mild allergic reactions, you can take an oral allergy medicine like Benadryl, which is available over the counter. It’s also a good idea to use some kind of topical anti-itch treatment. You have several options. Baking soda mixed with water makes a paste that can take away bug bite itching. It’s an easy and inexpensive treatment that many people have readily available in their kitchen. There are also prepared creams with baking soda that are sold specifically for treating itchy skin irritations. Calamine lotion is another topical treatment for itchy skin. You just dab some on the bites to soothe them. For really annoying bites, a topical steroid like hydrocortisone will probably provide the most relief. Hydrocortisone creams and ointments are available over the counter. Anything that soothes the skin can help, and any of these are useful for regular insect bite itching, even if you do not have an allergic reaction. For more severe allergic reactions, you should seek treatment from a doctor. Aside from hives, more severe symptoms of allergic reaction could be immediate swelling of bites, anaphylaxis (swelling of the airways and difficulty breathing), and asthma attacks triggered by bed bug allergy. Seek emergency treatment immediately if you have a severe allergic reaction to bed bug bites. Regardless of whether you have an allergic reaction, you should take certain steps to care for your skin when you have itchy bug bites. The absolute most important thing is not to scratch the bites. Scratching irritates the bites, making them more inflamed. That can make them more painful and even itchier. Not only that, but scratching creates tiny knicks in the skin, and those can become infected. Bug bites become a more serious problem when they develop into a skin infection. If you have scratched the bites or suspect infection, apply a topical antibacterial ointment or spray to the injured skin. You can prevent scratching by wearing clothing or bandages over the bites. You should also wash the affected skin with soap and water regularly. Dry skin makes itching worse, so applying moisturizer after washing can help keep the skin from drying out and feeling more irritated. Bed bug bites are often confused with the bites of other insects and arachnids. The issue is that you don’t usually see exactly what it was that bit you. Here are a few bugs with bites commonly confused with bed bug bites. Spider bites appear as inflamed red spots, much like bed bug bites. A big difference between bed bugs and spiders is that spiders tend to bite only once. If you have a single bite mark, you have likely been bitten by an upset spider. Spiders only bite humans in self defense. They do not feed on human blood. 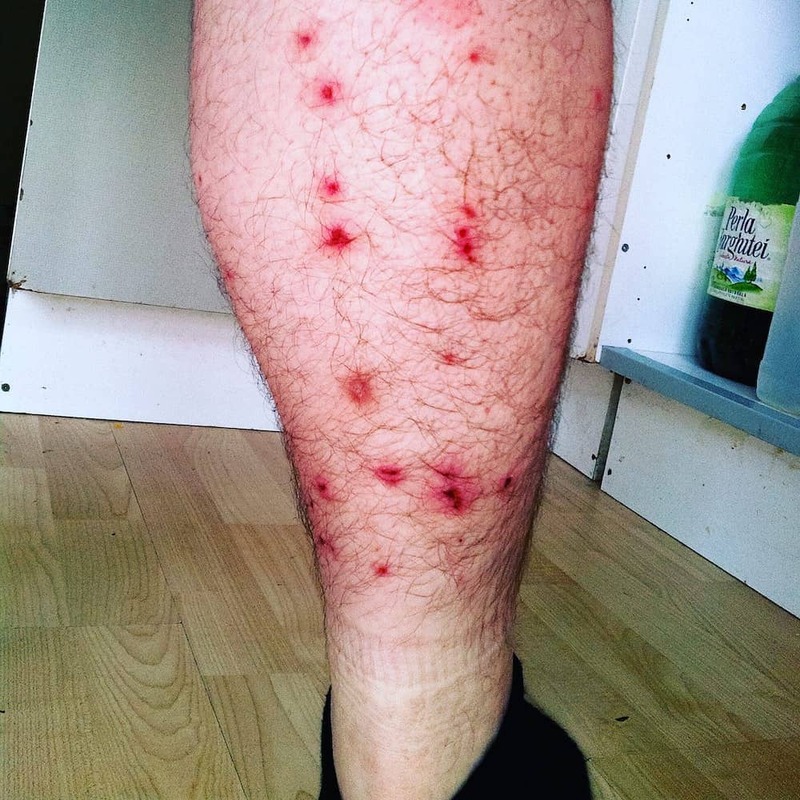 Mosquito bites are another mark often confused with bed bugs, especially since mosquitoes are happy to bite more than once and in groups of multiple individuals. That means if you wake up with many red bumps, it can be hard to know if it was bed bugs or mosquitoes. Also, both can be quite itchy. A primary distinction between the two is that mosquitoes fly around and find new spots. The bites can be quite far apart from each other and even on different body parts all together, though they may also bite several times in close proximity. Mosquito bites, however, do not travel in a line pattern, the way that bed bug bites do. They are randomly patterned. They also tend to be more raised than the flatter bed bug bites. 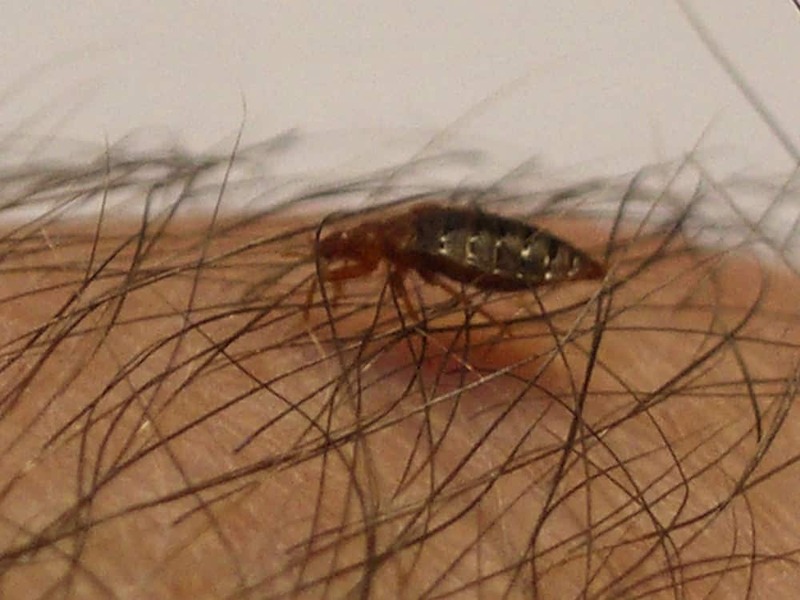 Flea bites look quite similar to bed bug bites, but like mosquito bites, they also swell up into a bump relatively quickly and begin to itch. Flea bites are also patterned randomly, rather than a straight line, because fleas can jump quite large distances between bite areas. Flea bites are generally smaller than bed bug bites, and can appear more like a rash than a group of bites. If you have flea bites, you are also more likely to spot the culprits because fleas like to live on their hosts, often pets. Ticks are not insects. They are arachnids, like spiders. They do, however, like to feed on human blood. 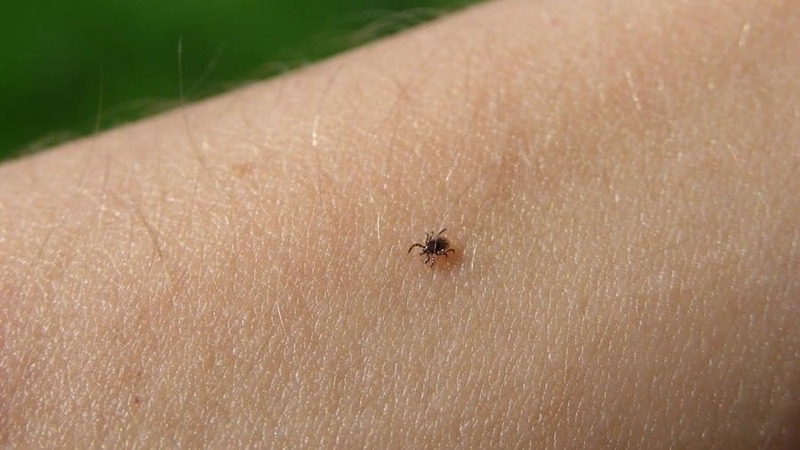 Ticks do this in a different way from bed bugs, mosquitoes, and fleas. They stick more of their mouth parts into the skin. Tick bites tend to look like flat red circles. However, if the tick is infected with lyme disease, the bite will often spread into a bull’s-eye pattern, with concentric red rings around the initial site of the bite. This characteristic bite mark distinguishes tick bites from the bites of most other insects and arachnids. Chiggers are tiny mites, similar to dust mites, except that instead of living indoors, chiggers tend to live outside in grassy areas. You can pick them up when you’re outdoors, but they don’t usually follow you inside or create pest infestations. If you’ve been outside, chances are your itchy skin is from chiggers, which like to eat shedded skin cells. Chigger bites are small red welts that can look kind of like pimples. People often get them on their legs from walking in tall grass, though children sometimes get them in other areas if they’ve been playing on the ground outside. Because chiggers often feed in groups, you’ll likely have multiple marks, but unlike bed bugs, you shouldn’t continue finding new bites after they heal, unless you’ve been spending time outside regularly. Bed bug bites are pretty typical looking as far as bug bites go. Unfortunately, that’s what makes them difficult to identify compared to the marks of other insects, arachnids, and mites. Look for mostly flat red circles that become itchy after a while. Note, though, that the bites can become raised like blisters. The key distinguishing feature of bed bug bites is that they follow a linear pattern as the bug crawls across your skin for multiple feedings. Although it’s hard to know what bed bug bites look like compared to other bites, knowing the habits of various bugs can help you figure out which one is likely the source of your bites.